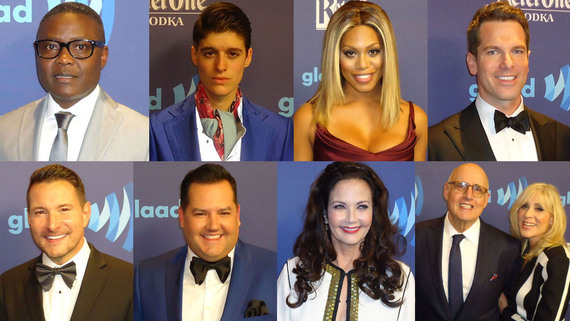 This week I talked with nineteen celebrity activists on the Red Carpet at the 26th GLAAD Media Awards in NYC. First I spoke with Steven Petrow an award-winning journalist, author and host of "Modern Manners Expert" for Hilton Worldwide which is a fierce sponsor for the GLAAD Media Awards and our LGBT community. Next I talked to ESPN's Christina Kahrl who's also a GLAAD Board Member. Kahrl who is currently writing and editing for ESPN talked about the importance of trans issues and supporting LGBT athletes especially for our younger generation. Then I talked with Police Chief Crystal Moore who was unfairly fired by the Mayor of Latta, South Carolina. Moore accepted the GLAAD Award for Outstanding TV Journalism Segment: "Fired for Being Gay?" MSNBC Live (MSNBC) with MSNBC reporter Craig Melvin. She attended with her partner Kristi Isgett on her left in our photo. I was then joined by Jenny Boylan, Co-Chair GLAAD Board of Directors whose autobiography "She's Not There: A Life in Two Genders" was the first book by an openly transgender American to become a bestseller. Sarah Kate Ellis President & CEO of GLAAD and her wife Kristen Henderson founding member of the all female popular rock band Antigone Rising then stopped by to share news about GLAAD's upcoming Nashville event "The Concert for Love and Acceptance" that's happening June 12th in Nashville and their plans for a bus tour through our Southern states to continue their work towards national LGBT equality. Then I chatted with LGBT ally actress Louise Sorel who played the villainous role of Donatella Stewart on the Soap "Days of Our Lives" for 10 years followed by her friend actress and LGBT ally Crystal Chappell actress from "The Bold and the Beautiful" who is committed to LGBT youth. The Emmy-winning actress-producer Chappell is Ambassador for Harvey Milk High School in NYC and Ambassador for the Hetrick-Martin Institute. Next I talked to Trans actress Trace Lysette who plays the sassy yoga instructor Shea on "Transparent" and has been living out her acting dreams since she landed her role in the trans-themed Amazon breakout hit. Then Cory Wade from the 20th cycle of America's Next Top Model stopped by to give me his spin on our LGBT issues. Ugandan LGBT Activist Pepe Julian Onziema who accepted the GLAAD Award for Outstanding Talk Show Episode: "Pepe Julian Onziema" for Last Week Tonight with John Oliver on HBO chatted with me about the struggle for LGBT civil rights in his country. Then model Rain Dove talked about the importance of being yourself. Rain is the firefighter turned fashion model who has leant her image to designers like Malan Breton, Vivienne Hu, Chromat and Rochambeau at the recent Mercedes Benz New York Fashion Week and doesn't care if you think she's a man or a woman. Next I caught up with Laverne Cox who's had an amazing year from appearing on the cover of Time magazine, named one of Time's 100 Most Influential People of 2015, won a SAG Award for "Orange Is the New Black" and the Daytime Emmy for her documentary Laverne Cox Presents: The T Word. MSNBC's Thomas Roberts who received the 2015 Vito Russo Award talked about how honored he is to be recognized with this award named for one of the founders of GLAAD and how he believes ENDA needs to be addressed and passed to ensure workplace protections for our LGBT community. Then country music singer Ty Herndon who performed at the Awards talked about coming out last year and being embraced by his fans. He also discussed GLAAD's Nashville: The Concert for Love and Acceptance happening Friday, June 12th in Nashville which he will headline. Television personality Ross Matthews who hosted the GLAAD Awards stopped by to talk about the importance of taking a moment to celebrate our LGBT advancements. Then actress and LGBT ally Lynda Carter who was there to present Thomas Roberts with the Vito Russo Award talked about how honored she was to do so as well as give us her spin on LGBT equality. I concluded my Red Carpet coverage with fierce LGBT allies actors Judith Light and Jeffrey Tambor from the hit Amazon series "Transparent" who both talked about the importance of using their celebrity to make change for LGBT and gender equality stating, What is most important is that lives are being saved. That's bottom line. Kelly Ripa was also honored with GLAAD's Excellence in Media Award.